There are some people who believe that all penguin penalties are the same but as you are aware Penguin penalty can be of three types – Manual penguin penalty, Algorithm Penguin penalty and partial match Penguin penalty. In case of Manual penguin penalty, your website will get a message in the Webmaster Tools Account. In this type of penalty, a Google representative manually reviews a website and if it appears that the site is violating the guidelines of Google, a manual penalty is applied on the website. In case of Algorithm Penguin penalty, you need to wait for months to be able to recover as Google updates its Penguin algo very rarely. Unlike Manual penalty, in case of Algorithm Penguin penalty you would not have to send any reconsideration request to any Google representative. Partial Match Penalty is applied when Google detects that a certain section of your website is doing something that goes against its guidelines. It is seen that sites with a section for users’ generated content tend to get penalized by this type of penalty as they have zero control over this section or as this section gets hammered by spammers. Once you have identified the type of Penguin penalty, the next step is eliminating the cause of the penalty. 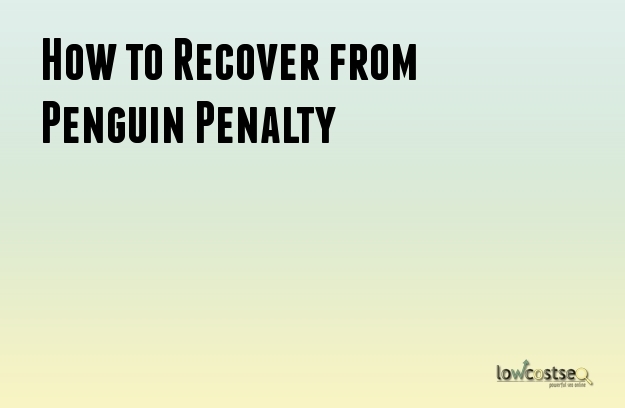 As we are all aware of the fact that penguin penalty has something to do with bad links, the first step of penguin recovery starts with removing bad links pointing to your website. Use AHref, Moz or any other backlink checker tools to be able to get an overlook of the inbound links that point to your website. You need to download all links from your Google Webmaster Tools account and then you need to check every link carefully. You should not be removing all the links that point to your website because that might lead to more harm than good. Here are some factors that you need to analyze while trying to judge the quality of a link. You need to remove all links with exact match anchor texts. It is very easy for Google to identify inbound links with exact match anchor texts and therefore, you need to get them removed as soon as possible. If you happen to build any low quality links like links from bookmarking sites, directory submissions or spammy guest posting, you need to remove them as well. Once you are done with the link removal thing, you need to send a reconsideration request to Google representative from Google Webmaster Tools Account. You also need to upload a disavow file to disown those spammy links that you have not built or links that you have failed to remove. Once done, wait for the penguin refresh.